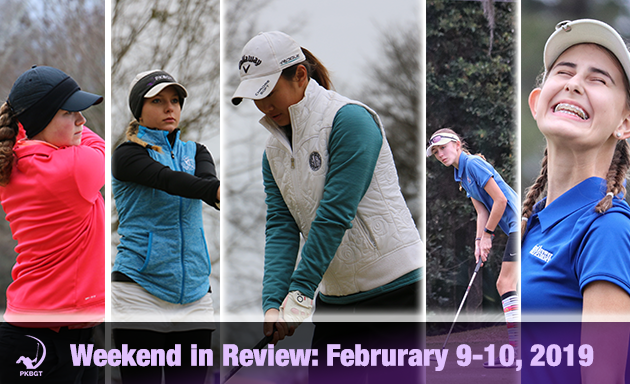 It was an action-packed weekend on the Peggy Kirk Bell Girls’ Golf Tour, traveling south for two events between February 9-10, 2019! The National Series set camp at Clemson University for the 2019 Orange Whip Classic while Sanford, FL was the setting for the Central Florida Series at Mayfair Country Club. The Walker Course at Clemson University played host to the PKBGT National Series’ 2019 Orange Whip Classic presented by Orange Whip Golf. Players battled the elements all weekend, with real-feel temperatures peaking in the ’30s on Sunday and stiff winds gusting off scenic Hartwell Lake throughout the tournament. All-in-all, the field of 68 didn’t allow the conditions to impact their stellar performances. Kimberly Shen (John’s Creek, GA 2022) brought home the glass bowl trophy in the Bell National Division. Shen won in dramatic fashion, chipping in for birdie from just off the green on 18 and avoiding a three-way playoff hole tiebreaker. Kallie Pavlish (Charlotte, NC 2020) won the Prep Preview division, rallying ahead after sitting in a tie for the lead through nine holes in the final round. Abigail Cheney (Guyton, GA 2021) held a lead throughout the duration of the tournament, never relinquishing her position atop the leaderboard and winning the Futures National division. Courtesy of our tournament partner, each champion was sent home with a brand new Orange Whip Golf Trainer! Further south in Sanford, FL, the PKBGT played the Central Florida Series at Mayfair Country Club. Caroline McConnell (South Fayette, PA 2022) won the Prep Preview division after shooting an 82 (+10) on the day. Abigail Fernandez (Windermere, FL 2023) took home first place honors in the Futures division, shooting an 80 (+8). Fernandez remains perfect on the season, winning the first two events of the season in the Central Florida Series. Mara King (Longwood, FL 2025) won the Discovery division with a score of 38 (+2). King now has her second top-two finish of the season and her first win. There was significant movement in the PKBGT rankings following this weekend’s events. Kimberly Shen earned #MoverOfTheWeek honors, skyrocketing 52 spots in 27th on the Bell National Order of Merit rankings. Catie Craig (Sautee Nacoochee, GA 2021) jumped two spots into first place after a strong first round performance that landed her in the final pairing on Sunday. Macy Pate (Boone, NC 2024) moved up seven spots to fifth place on the Prep Preview Order of Merit rankings following her runner-up finish at the Orange Whip Classic. Abby Franks (Roebuck, SC 2023) jumped two spots into second place on the Prep Preview OOM and Madison Lynn Dixon (Inman, SC 2023) moved up one spot into third place. Abigail Cheney rose 43 spots to 20th in the Futures National Order of Merit after winning the Orange Whip Classic. Bethany Welch (Matthews, NC 2023) jumped 26 spots to 23rd in the rankings after playing alongside Cheney in the final pairing of the Futures National division. Sophie Lauture (Raleigh, NC 2024) moved up three spots into second place on the Futures National OOM, playing alongside Cheney and Welch in that final pairing at Clemson University. The National Series travels to the second Division 1 course in as many weeks, playing the Rocket Tour Players Championship at the University of Georgia in Athens, GA.
Tour Director Mike Parker will be hosting a webinar on Wednesday, February 13th at 7 p.m. to discuss the rankings systems and how to organize your tournament schedule to maximize the benefit and development of your daughter! Additionally, Mike will be answering any questions you may have about the rankings systems, the PKBGT progression pathway, and scheduling tournaments!